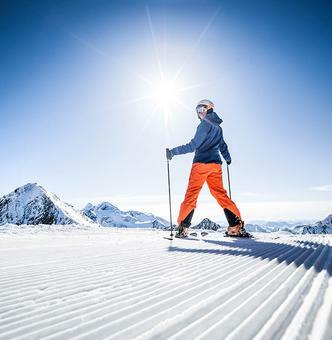 The Ski Season in Austria's largest ski area has started! Currently skiing on 5 glaciers: Eisjochferner, Daunferner, Windachferner, Gaisskarferner and Fernauferner. Skiing as far as middle station Fernau 2.300 m.
Overview of all open lifts, pistes, restaurants and infrastructure facilities. Ski passes for the Stubai Glacier are available at the valley stations, at the Neustift lift pass Office and online. Accommodation & ski pass at special rates at the start of the season! Book your skiing holidays now!